Major aspects of the evolution of marine avifaunas were summarized by Warheit (1992, 2002), although these reviews mainly concentrated on the Neogene fossil record. Among the most notable particularities of Paleogene marine avifaunas is the existence of giant soaring and diving birds without modern counterparts. Whereas the former (Pelagornithidae) already seem to have achieved a worldwide distribution in the early Eocene, the latter were restricted to the Southern Hemisphere (Sphenisciformes) and the North Pacific (Plotopteridae). Today, the Procellariiformes, Phaethontidae, Fregatidae, and some Charadriiformes (Stercorariidae, Laridae, Sternidae, and Alcidae) are the predominant taxa among the volant pelagic birds, i.e., those that regularly feed offshore. By contrast, the most abundant and widespread pelagic birds of the early Paleogene seem to have been the Prophaethontidae and Pelagornithidae, which are found together in several fossil sites, such as the early Eocene of the Ouled Abdoun Basin in Morocco and the London Clay. Medium-sized pelagornithids coexisted with very large forms in the early Paleogene, but there appear to have been only giant representatives of this taxon in the Neogene. Concerning a trend toward gigantism, pelagornithids paralleled the Mesozoic pterosaurs, of which also only the giant forms survived into the late Cretaceous. In the case of pterosaurs, it has been hypothesized that competition with birds led to the extinction of the smaller species (Paul 2002). In analogy, ecological competition with other marine birds for food and/or breeding sites may have played a role in the extinction of smaller pelagornithids. Just because of their very large size, pressure of competition may have been lower for the giant species, although the extreme specializations of the flight and feeding apparatus of bony-toothed birds made them prone to environmental changes and ultimately proved to be an evolutionary dead end. Still, however, more data have to be gathered on the stratigraphic distribution of these birds to conclusively show whether extinction of the smaller pelagornithids was due to competition with other birds or whether the latter filled ecological niches left after extinction of the smaller bony-toothed birds. It is notable that the earliest well-known representatives of the Procellariiformes, the Oligocene Diomedeoididae, had a highly specialized foot morphology (Sect. 7.5). The greatly widened pedal phalanges of these birds indicate that the feet were used as a brake for rapid stops or as an anchor to avoid drifting from strong winds. The evolutionary significance of this feature with regard to niche competition with other marine birds still needs to be addressed. A similar foot morphology is today only found in much smaller procellariiform species, whose distribution is mainly restricted to the Southern Hemisphere. 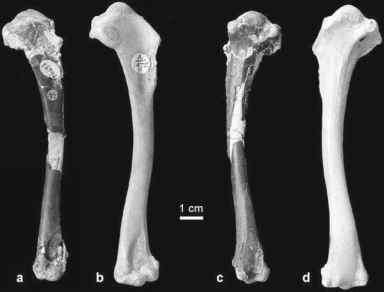 Even the earliest representatives of the Sphenisciformes and Plotopteridae were large compared with extant flightless diving birds (Sects. 7.2, 7.3). The giant penguins became extinct toward the late Oligocene (Clarke et al. 2007). Plotopterids also disappeared from North America toward the late Oligocene and only survived in Japan into the early Neogene. Similarly sized diving birds do not exist in late Neogene and extant avifaunas, and various factors have been suggested to explain their disappearance. Goedert (1988), in the case of plotopterids, and Vickers-Rich (1991, p. 748), concerning penguins, assumed that it may have been due to climatic reasons. Simpson (1971) considered it possible that the giant penguins succumbed to competition with pinnipeds and cetaceans, which was also assumed by Olson and Hasegawa (1979) in the case of plotopterids. In the eastern North Pacific, plotopterids coexisted with odontocete cetaceans from at least the late Eocene on (Goedert and Cornish 2002), which makes it unlikely that competition with whales played a major role in their extinction. However, Warheit and Lindberg (1988) detailed that interference competition at breeding sites with land-based gregarious pinnipeds, such as elephant seals, has a significant impact on large flightless seabirds. They hypothesized that in New Zealand and Australian penguins this led to shifts to smaller body sizes, which temporally coincided with the first local appearance of gregarious pinnipeds (Warheit and Lindberg 1988). As further set forth by these authors, many extant penguins nest in hilly or rocky terrains that do not allow large aggregations of pinnipeds, or are fossorial, i.e., breed in earth tunnels, thus avoiding breeding competition with pinnipeds. According to Goedert and Cornish (2002), the local extinction of plotopterids at the Oregon and Washington coastlines may have been further boosted by the demonstrable disappearance of offshore volcanic islands as potential breeding sites toward the late Oligocene.